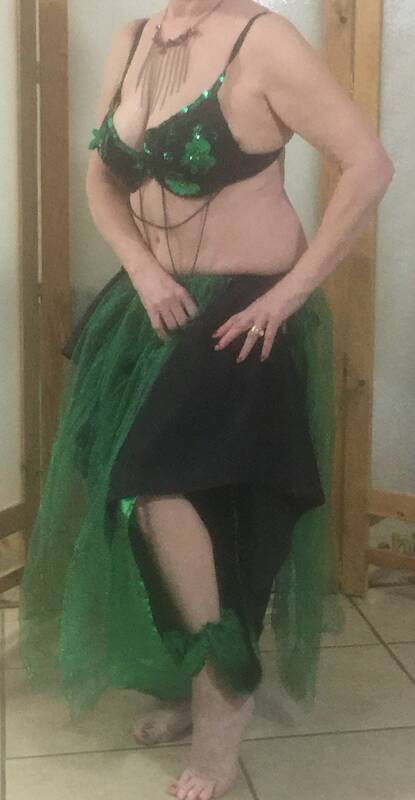 Bellydance skirt and bra top was originally a black taffeta dress and has been up cycled to a skirt with an elastic waist. Inside casing is still open and skirt will fit up to a 44" hip/waist and is 33 1/2" long. 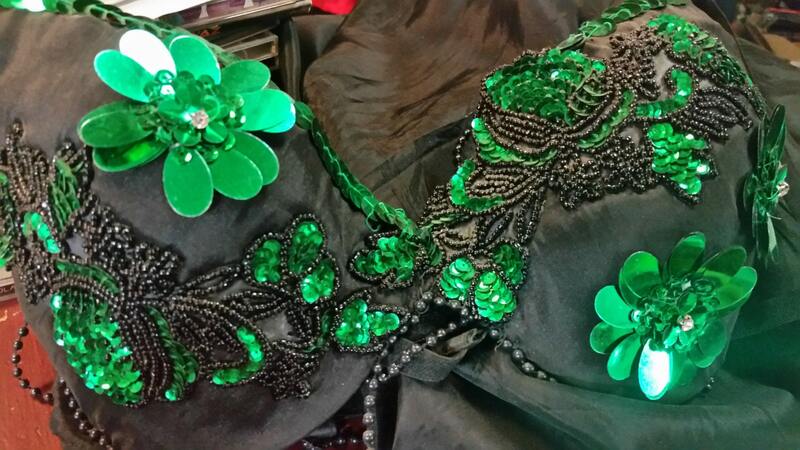 The bra top cups are covered in the same black taffeta and are adorned with appliques in green sequins and black beads. The bottom of the bra has 2 strands of dangling black beads. Size says 44D but I sincerely doubt that. Is is more like a 36-38 B/C cup but a bra extender could be added if need be. 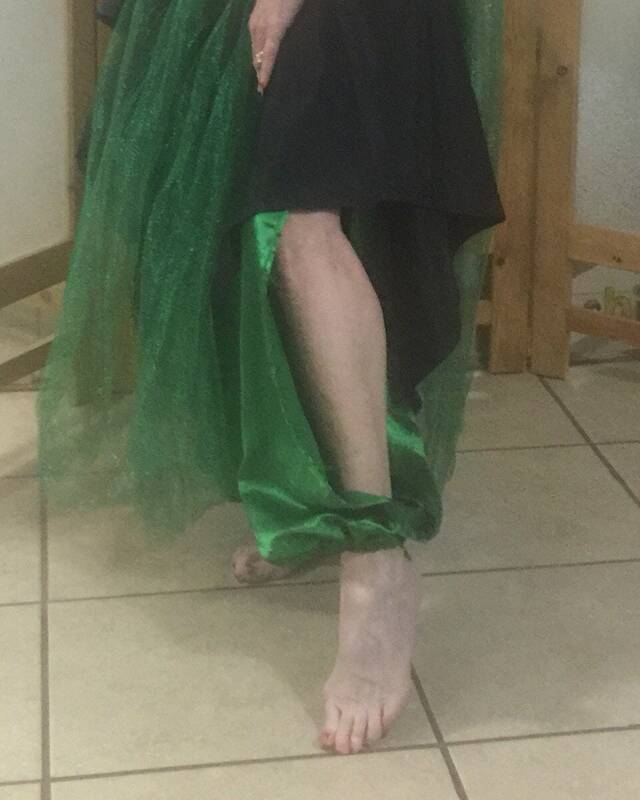 Green satin harem pants with slit up side leg from cuff to above knee. Green metallic tulle overskirt panels with 3 panels and satin elasticize waistband. 4 pieces mix and match for different looks. Black sequined skirt and halter. Not a prom dress anymore. Bedazzling sequins. 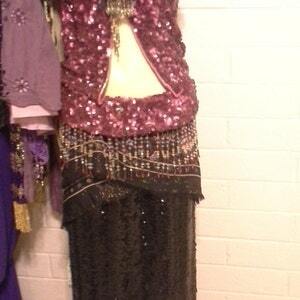 Bellydance costume Fits sm-md juniors. Tribal Fusion nellydance. Skulls on a mermaid style skirt and a sequined bra, black with pink and green. Woven belt with crystal buckle.